Former Rhode Island Governor, Senator - as well as former Republican - Lincoln Chafee joined the growing presidential Democratic field Wednesday evening. "We will be electing a new president in 2016. I enjoy challenges, and certainly we have many facing America. Today I am formally entering the race for the Democratic nomination for president," Chafee said during a speech at the George Mason Center for Politics & Foreign Relations. The crux of his campaign is likely to be foreign policy, the topic that he discussed the most in his announcement speech. Though his campaign slogan is "Fresh ideas for America," Chafee spent the beginning of his speech discussing his 2002 vote opposing the Iraq War. In 2002, while Chafee represented Rhode Island in the Senate, he was the only GOP senator to vote against the Iraq war authorization. "Without a doubt we have prodigious repair work to do in the Middle East and North Africa. We have to change our thinking. We have to find a way to wage peace," Chafee said. "Let's have a rewrite of the neocons' project for a new American century. It is essentially the opposite proposed in the original. We will be honest and tell the truth. We will be a good international partner and respect international agreements." His other campaign promises include ending the practice of appointing prominent campaign donors to high-profile ambassadorships, allowing Edward Snowden to return to the U.S., and ending the use of drone strikes. "Extrajudicial assassinations by drone strikes are not working. Many blame them for the upheaval in Yemen," Chafee said. He also proposed that, as a "bold embrace of internationalism," the U.S. "join the rest of the world and go metric." He revealed that he lives in Canada. "They completed the process. Believe me, it's easy!" he said. Though few of the challengers to frontrunner and former Secretary of State Hillary Clinton have made the race close in this early stage, Chafee also trails those other candidates, former Maryland Gov. Martin O'Malley and Vermont Sen. Bernie Sanders. His run has not attracted much attention. According to the Associated Press, Chafee's wife Stephanie wrote on her Facebook page three weeks after he announced his exploratory committee, "No one has contacted him ... so SAD!" Her page has since been taken down. 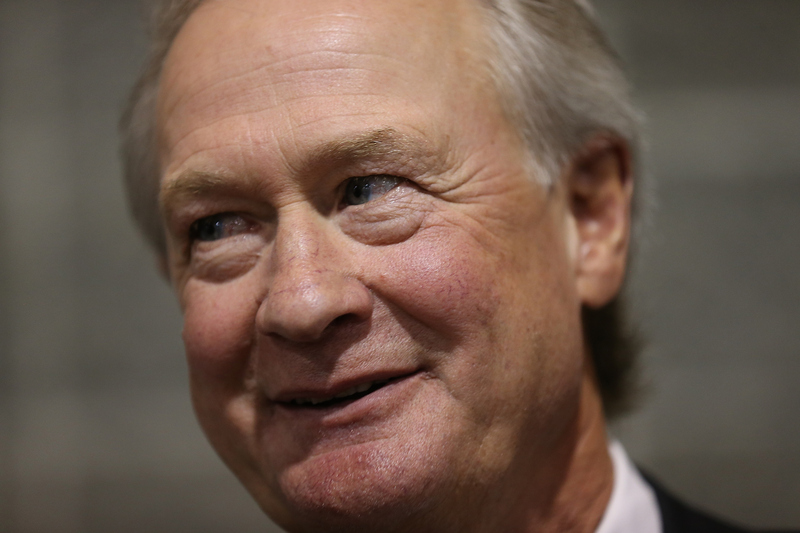 After he formed his exploratory committee in April, Chafee told CNN that he intended to criticize Hillary Clinton, the presumed frontrunner for the nomination, for her 2002 vote to authorize the Iraq war. He said in the interview, "Considering the premise for invading Iraq was based on falsehoods and considering the ramifications we live with now from that mistake, I would argue that anybody who voted for the Iraq War should not be president and certainly should not be leading the Democratic Party." After serving one term in the Senate, Chafee lost his seat to Democrat Sheldon Whitehouse in 2006. He then left the GOP to become an independent, endorsed President Obama's 2008 presidential campaign, and was elected governor of Rhode Island in 2010. In 2013, he announced he was joining the Democratic Party, but facing low approval ratings, he opted against seeking a second gubernatorial term. On his 2016 website, Chafee lays out his priorities, shares his biography and offers up a link to his 2008 book, "Against the Tide." The Democratic National Committee welcomed him to the race with a statement saying, "As a former Republican, Lincoln Chafee can help make the case that his old party no longer represents the best interests of the American people. The Democratic Party is the natural home for those of us who share the values and priorities of middle class families."